In which we deconstruct the classical Greek root "Hexa"
With Razer’s DeathAdder, Mamba, Naga, and DiamondBack mice all safely transitioned to shiny new Chroma-lit casings, it’s time the MOBA-centric Naga Hex got an upgrade, right? I hope you said “Yes” because that’s what’s happening. 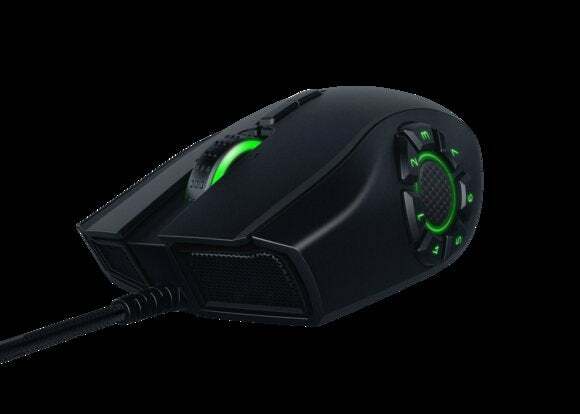 The Naga Hex launched in 2012 as an offshoot of the MMO-centric Naga line. Where the Naga has a telephone-style numpad underneath the thumb, the Naga Hex has a circular arrangement of six buttons. Or had. In addition to the Naga Hex V2’s new lighting, the biggest change is that there are now seven buttons under your thumb, still arranged in a circular pattern. Honestly, I debated not writing this story—a Razer mouse getting Chroma lighting isn’t especially surprising at this point, and we could’ve waited until the review. But I’m baffled. As you probably know, “Hex” is a prefix derived from the Greek word “hexa,” for six—as in “Hexagon” or “Hexapod” or “IKEA keeps giving me all these stupid Hex Keys.” Thus, Naga Hex was a perfect play on words when there were six buttons on the side, because a) Six buttons and, b) it’s like, magic and stuff. But then Razer went and botched it. Seven damn buttons on the side? That ain’t no Naga Hex, that’s a Naga Hept, and don’t let anyone tell you different. Anyway, the mouse seems capable. 16,000 DPI laser sensor, sensitive left/right click buttons, and a classy black casing instead of the previous Naga Hex’s weird green-lightning design. Oh, and a seven foot cable. I don’t play MOBAs often, nor do I really love either the original Naga or Naga Hex for day-to-day use, but if you’re in the market for a mouse with a lot of buttons, well, this one has a lot. Including seven on the side. Look for the Naga Hex (Hept) V2 in the Razer Store soon, priced at $79.99. That’s seventy-nine dot ninety-nine.